67 KAMAZ trucks have been delivered to the UN World Food Programme in Uganda. The Russian trucks will assist the WFP’s transportation service to provide needy countries with humanitarian aid. 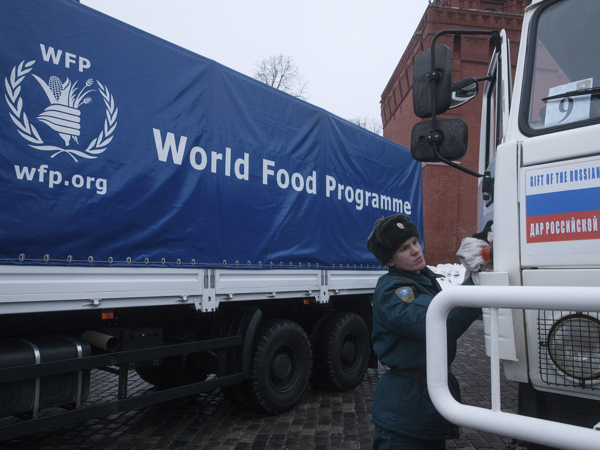 The KAMAZ trucks are Russia’s in-kind contribution to the UN World Food Programme. Sergey Shishkin, the Russian ambassador to Uganda; Musa Ekveru, Ugandan Minister for the Prevention of Disasters; and Michael Dunford, Director of the WFP in Uganda, attended the ceremony for the transfer of the trucks. The new KAMAZ vehicles have become part of the regional fleet for the UN World Food Programme, which is based in Kampala and carries out operations in Uganda and neighboring countries. 53 KAMAZ trucks were immediately sent to help with the supply of products and humanitarian aid in South Sudan, and the rest will be used in Uganda. The Russian government allocated more than 720 million rubles from the federal budget to purchase trucks for the needs of the United Nations. From 2014 to 2015, a total of 218 trucks will be transferred to the World Food Programme. The first batch of KAMAZ trucks for the WFP was delivered in December 2014. At the time, Russian Foreign Minister Sergei Lavrov and WFP Director Ertarin Kazin signed an agreement for a strategic partnership between Russia and the World Food Programme between 2014 and 2017. KAMAZ is the largest Russian manufacturer of commercial vehicles. It includes more than 150 organizations located in Russia, the CIS and abroad, including 12 major automotive manufacturing plants. It has assemblers in Vietnam, Iran, India, Kazakhstan, and Pakistan.